I Just pick an elite dentist to touch my teeth. Dr. Moore did an outstanding distinguished work to my teeth. He’s talented and treating his patients with absolute care. Dr. Moore and all he staff are great. So friendly and accommodating. Never a shortage of good things to say about all my experiences. Dr Moore and his staff are amazing! They make my family and I feel comfortable at all times! They are very professional, courteous and friendly. We will continue to recommend Moore family dental to any and everyone we know! Brand new patient and have never met a more friendly, professional and efficient staff. Each and every person, from office, to hygienist to dentist all provided top notch care. I've worked as a RN for 36 years, so believe me when I say I don't think you'll find anyone better, and I'm hard to impress. Also state of the art dental equipment that helps streamline your appointment. AND conveniently located to major shopping! So when you leave with your dazzling , fresh smile you can run your errands. Two birds, one bright smile! I was so impressed with Dr. Redman and the staff. I walked in with a broken tooth and a lot of apprehension. I left with a crown and a smile all within a couple of hours. It was an amazing process from start to finish. And did I mention painless? Gone was the dreaded needle that would cause my entire body to brace, my eyes to water and my hands to grip the ends of the arm rest. There's now a new PAINLESS device called a Wand. Love this place💕 Thank you! Always a nice experience at Moore Family Dental! Dr. Moore and his team are the best in town! Excellent dental care! Kind & friendly service. Outstanding and I hate going to the dentist. Always a fabulous experience! Wonderful staff and no pain dental work. Love the Moore Family Dental Group! Amazing as always. I adore Dr. Moore and all of his staff. They are so kind and non-judgemental. The level of care I’ve always gotten at Moore Family Dental is Excellent. Drs. Moore and Redmin and my Hygienist Eileen all do an excellent job and are very caring professionals. They always explain things and answer any questions I might have, and try to make me as comfortable as possible. I highly recommend Moore Family Dental. Dr. Moore and his team are exceptional professionals and care about their patients in every way! Thank you for your expertise and kindness in providing superb dental care – whether there is a routine need or a difficult case! The Moore Family Dental team is the best! I am honored to be your patient! 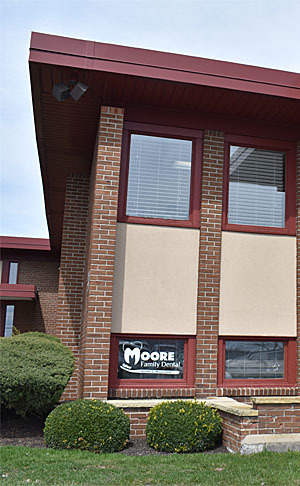 We have been going to Moore Family Dentistry for several years. The Staff is outstanding – they always go over and above.You can tell they all love working there. The hygienist is very pleasant, gentle, and uses careful sterile procedures. Dr. Moore is by far the best dentist we have ever gone to. He is thorough, knows his dentistry VERY well, and a pleasure to deal with. He and the hygienist always answer questions and communicate what they are doing. My husband and I have come here for years and recently started brining our son. We all have the same hygienist every time which is so great because we feel really comfortable with her. Dr. Moore is super friendly and diligent. If you want a laid back, personal Experience this is the place to go! I love all of the staff at Moore Family Dental. Everyone is pleasant and it really feels comfortable there. I had to change insurance and my new company didn’t cover Moore, but I’m staying. I pay out of my own pocket. I’m a diehard fan! I lived in Houston, Texas for thirty one years, and hated to leave my dentist, when I relocated. As soon as I stepped into Moore, I felt at home. The office staff is wonderful, the Hygienist is superb, and the dentist is proficient. I am finally home.